BLACKPOOL, ,SATURDAY. —A Press view of the Blackpool St. Annes and Lytham Tramway Company's new gas traction trams took place to-day at Blackpool. Amongst those present were—Messrs. Roger Wallace, Q.C., chairman of the Gas Traction Company, Limited; Fletcher Moulton,. Q.C. ; the Honourable Ormsby Gore, and Mr. P. Holt, of Crossley Bros., Manchester ; Colonel Ellis, the Mayor of Liverpool, and the Corporation and representatives of St. Anne's and Lytham. The tramway at present extends from Blackpool to some distance past St. Annes, but when completed, which will shortly be the case, there will be tramway communication from Lytham to Blackpool, and by arrangement with the Blackpool Corporation Tramway Company passengers will be able to book right through. The gas trams have machinery underneath driven by a two-cylinder 15 horse-power Otto gas engine. Compressed gas is stored capable of running the car for eight miles without refilling. The gas is obtained from the town mains, compressed at the company's station, and the process tilling, which occupied under one minute. is dune by means of an india rubber pipe. and the operation is of the most simple description. The engine at the compressing, station is of 8 horse-power, though it is not necessary to keep it always at work. The road from Blackpool to St. Annes is for the most partaking country roads and by the sea coast. Sonic rather steep gradients had to be mounted, which feat was easily accomplished by the cars running at a speed of eight miles and hour, the limit allowed by the Board of Trade, though the cars are capable of running twelve or fourteen miles an hour. The car is very handsome, and capable of carrying forty passengers inside and twenty-four outside. The seating accommodation both in and out is most comfortable, the latter being the ordinary garden seat. and the absence of vibration, noticed to so considerable an extent on the motor cars, is almost, if at entirely. absent. The fly-wheel of the engine when the car is going makes 260 revolutions per minute, and when stationary about 80 per minute. The machinery is started by means of an electric spark, which automatically explodes the gas. The weight of the tramcar complete is about seven tons. The idea of gas traction is absolutely new to England, though it has been well tested in Germany, there being three systems at Dresden. Berlin. and Dessan, and the cars have run since the inception of gas traction three hundred and fifty thousand miles with the greatest success. Little progress has been made with mechanical traction in this country, the great objection to electricity being the overhead wires, which is the cheapest mode of electrical traction. 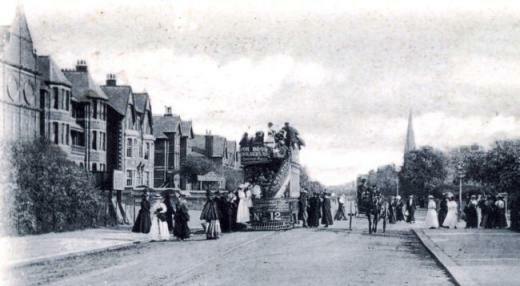 The new mode, however, has been warmly received by the Corporations of Blackpool, Lytham, and St. Arms, the idea. being to make those three places one large watering place, or one large Blackpool. The initial expenditure is the chief objection. to underground conduits, but it is claimed that gas motor cars will fulfil the varying requirements of tramway work. All parts of the propelling engine are arranged so that they can he easily reached both from above and underneath for purposes of oiling, cleaning, and repairing. The expense of gas as compared with electricity is small, the price per mile for gas alone being one penny, that amount being arrived at on the basis of 2s 6d per thousand feet. In Germany the official figures allow that the total charges per horse-traction is 5½d per mile; electricity, 3½d; and gas, 2½d. The reason of the cheapness of gas is due to the fact that no conductors or expensive machinery ere necessary. Another advantage to which attention is called by the Gas Traction Company is that there is no soot (a fact which will be appreciated by Lancastrians, who are overrun with smoking and ugly steam trams), smoke, noise, vibration, or smell. One eight horse-power engine is capable of I compressing gas sufficient for twenty trams, whereas electricity would require an engine of two hundred horse-power.